Good for all ages, this adorable soft plush frog is easy to hug..
Snuggling up with this adorable dangling frog from Steiff is sure to make bedtime stories much more fun! 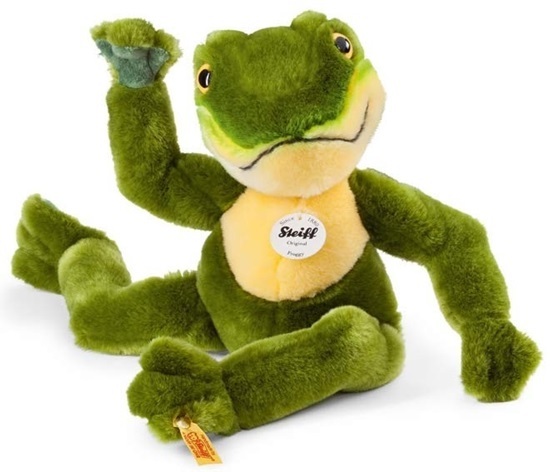 Meet "Froggy", a soft plush frog from Steiff's "Best for Kids" Collection. Froggy is made from a vivid green and lemon yellow woven fur. He has big yellow glass eyes and a black embroidered mouth. His long, dandling limbs add to the fun of putting him in silly positions. He has green plush paw pads, and is machine washable. He has the yellow tag "Button in Ear" and is 12 inches tall.